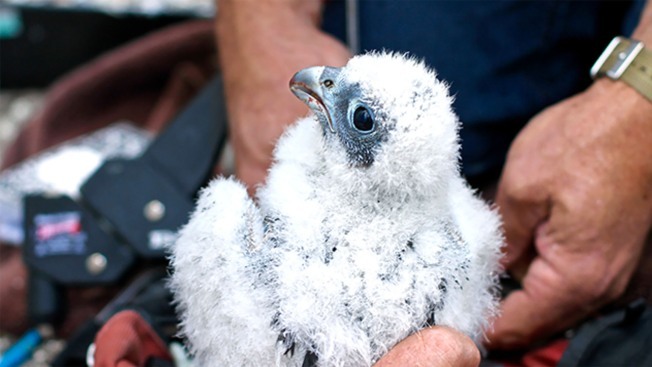 Lux, one of two peregrine falcons born at UC Berkeley's famed Campanile tower in May, died on Tuesday after flying into a glass-enclosed balcony on campus. Lux became trapped inside a balcony at Evans Hall, a building near the Campanile, sometime Tuesday afternoon. It appears that the female fledgling slammed into the glass enclosure while trying to escape, according to the news release. The two babies — who learned to fly last week — became community favorites shortly after their birth was announced. They were soon named Fiat and Lux after the school's motto, meaning "Let there be light." East Bay Regional Park District's program manager, Doug Bell, told the campus newspaper The Daily Californian that a volunteer had seen an outline of the falcon's feathers imprinted on the glass, suggesting Lux's repeated efforts to escape the enclosure led to her death. Capable of reaching speeds of up to 250 mph, peregrine falcons are the fastest animals on the planet. Although they were once on the brink of extinction due in part to pesticides, the species has been rebounding in recent years and finding homes in unlikely places — like the campanile. The bird's body will be donated to the California Department of Fish and Wildlife, where scientists will test its tissues for toxins. After that, Lux's body will contribute to ongoing research at Berkeley's Museum of Vertebrate Zoology, according to the school.